EUR has lost its power due to the German 10-year government bonds yield which decreased. Today bears may become more active. On Wednesday EURUSD created a new high and has been falling down since then. 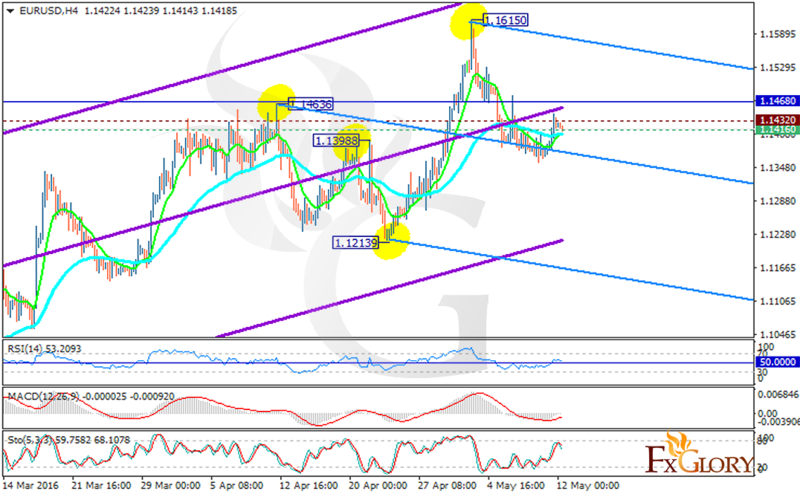 The support lies at 1.14160 with resistance at 1.14320 which both lines are below the weekly pivot point 1.14680. If the pair climbs up the long term ascendant channel it may break the resistance level and reach 1.15000. However all the indicators are showing price decline within the Andrews’ pitchfork. The MACD indicator is in negative territory, the RSI is in neutral area and the stochastic is suggesting price drop as well. The support level breakthrough can push the pair in lower ranges targeting 1.1260.